Roast and refrigerate a chicken for this salad ahead of serving time or use deli-roasted chicken. Place celery and onion in a roasting pan. Combine paprika, salt, pepper, and ginger; rub mixture over chicken. Place chicken on top of vegetables, and roast, uncovered, in a 400 degree F oven for 1-1/2 hours or until chicken is no longer pink and the drumsticks move easily in their sockets. Remove chicken from pan and reserve pan drippings. Let chicken cool about 30 minutes or until easy to handle. Cut meat into bite-size pieces to make 2 cups chicken. Save any remaining chicken and use for another purpose. Meanwhile, bring 1/2 cup water to boiling in a small saucepan. Add dried tomato halves. Cover, remove from heat and let stand about 20 minutes or until softened. Puree the mixture in a blender and add water or red wine to equal 1/2 cup, if necessary. Set aside. Cook pasta in a large amount of boiling salted water for 13 minutes or until tender. Drain, rinse, and set aside. Heat olive oil in a skillet. Cook mushrooms in oil until tender; add to drained pasta. In the same skillet, heat 1/4 cup of the pan drippings from chicken, the pureed dried tomatoes, and vinegar. Discard the remaining pan drippings. Add chicken pieces, tossing to coat, then add the chicken mixture and cherry tomatoes to the pasta mixture. Do not chill. (Salad may be held at room temperature for up to 30 minutes.) 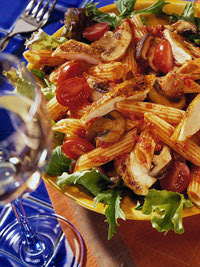 To serve, line a platter with salad greens and top with the pasta mixture. Makes 6 servings. Roast chicken; cool slightly. Cut into bite-size pieces. Cover and chill up to 24 hours. Cover and chill pan drippings. Calories 606, Total Fat 25 g, Saturated Fat 6 g, Cholesterol 105 mg, Sodium 435 mg, Carbohydrate 53 g, Fiber 4 g, Protein 43 g. Daily Values: Vitamin C 12%, Iron 32%. This entry was posted on 4:03 PM and is filed under Chicken . You can follow any responses to this entry through the RSS 2.0 feed. You can leave a response, or trackback from your own site.